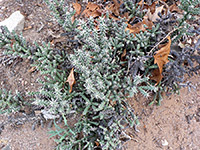 The usual form of cylindropuntia whipplei is an upright shrub, 6 feet or more high, with many 3 to 6 inch stems branching from a woody central trunk, though the plant also has a low growth variant, found in less favorable environments, where the stems are shorter, stay close to the ground and may have fewer spines. Stems are bright green or sometimes purplish green, bearing distinct tubercles and clusters of 3 to 8 white or yellowish spines, each between 1 and 2 inches long. The spines do not completely cover the stems. Whipple cholla is very frost tolerant, found at higher elevations (8,000 feet) and further north than other species. It most closely resembles silver cholla, but the range of the two species overlaps only in a very small area around Kingman, and the whipple cholla is somewhat less spiny. Another difference is the spineless, knobbly fruit; silver cholla fruit is very spiny, and has larger bumps. This species is the only cholla in most of its range - north Arizona and the Four Corners region.